Introduction: Teachers are the group most affected by vocal problems, under penalty of the appearance of dysphonia symptoms, more or less early, damaging the continuation of the teaching. Aim: The authors intended to assess the occurrence of hoarseness in the last year students of the degrees courses. Method: Prospective, individual, observational and cross study, interviewed 100 students collecting clinical, personal and business information. Results: Among the 100 students 65% already teaches in at least one institution of education. Of the total of students who already teaches 83.08% have some type of symptom related to the misuse of the voice. Among the students who already teaches, only 26.15% reported usually maintain some care with the voice, while 73.85% do not have.83.33% of the students when present a symptom related to the voice do not look for medical attention. Among the complaints the triad:pain or irritation (27.33%), hawk (21.33%) and hoarseness (21.33%) were identified as those of higher frequency.The symptoms was 27% for that one who usually drink less water, contrasting with 8% of those who drink more. Conclusion: More than half of students surveyed had been working as a teacher and presented complaints of hoarseness. It is essential that guidelines are provided vocal during those courses for graduation. The voice is part of the human socialization process, being a component of oral communication and interpersonal relations. It causes impacts on the quality life, especially on those who use their voices professionally1-17. Among these professionals who make use of their voices as a "working tool", teachers are the most affected by vocal alterations, either by misuse or excessive use of it. This is due to the need of adaptation of the phonation organs, which are likely to be affected by dysphonic symptoms quite early, damaging to the teaching activity2-4. In teaching activity, the voice is important for professional development and performance of teachers in the classroom, especially because it is a constructive component for teacher's identity as a professional, for the teacher-student relation and also a component of teaching-learning process1,5,6. In Brazil, surveys show that 25% of the working population depends on their voices as occupational tool. It is estimated that 2% of Brazilian teachers (around 25,000 professionals) will be withdrawn from their activities by problems in the larynx and in the vocal folds4,7. The Instituto de Previdência e Assistência do Município de Belém (IPAMB), registered 182 cases of occupational disorders in the City Government health services in 2005. Of those, 47% are from the Secretaria Municipal de Educação (Educational Department), and 30% of these are affected by dysphonia and acute hoarseness, being 19% teachers8. The proper use of the voice does not cause any fatigue to the phonation system. On the contrary, the vocal muscles and organs develop and strengthen by exercising. It is extremely important to provide a preventive care for the so-called professionals of the voice, in order to assure a more healthy voice, under basic cares and orientation. In that way, they are able to use their voices with its utmost potential without affecting the phonation system9. Dysphonia means any difficulty to vocalize emissions that prevent the natural production of the voice and it can also be either the main or the secondary symptoms. These symptoms can be: great emission effort; difficulty in keeping the voice; variation on fundamental, habitual frequency or on intensity; hoarseness; lack of voice volume and projection; loss of vocal efficiency and little resistance when speaking10. In order to achieve a normal phonation performance, it is necessary to combine the action between the larynx and the phonation system. The respiratory and resonance mechanisms together with the nervous system need to be adjusted to phonation. Due to the occupational activity developed, under long-working hours, improper working conditions, interference on the biological, emotional and environmental levels, the voice is damaged by its misuse and/or excessive use of the phonation system, and it is likely to present alterations and disorders. It is known that daily routine in schools has a high level of noise, caused by the high intensity of children's speech in competition with the environment noise, by making teachers raise their voices, which damages the teaching action due to a destroyed voice in constant use. All this can cause damages not only for the professionals but also for students and all the educational process. When teachers are off duty, on medical leaves for vocal rest, the teacher-student relation becomes broken, and this can especially affect the learning process11. The courses of Pedagogy, in its curricular agenda, are not provided with materials for orientation and prevention of vocal disorders yet. Despite of us living in modern ages, teachers still use their voices in an intense manner, i.e., shouting at students in order to establish authority. When teachers graduate, although they have been well oriented on education process, they are not aware of vocal health, developing vocal disorders when facing the lack of technique to use their voice11. The misuse of the voice is usually favored by the lack of knowledge on vocal production, by the lack of basic conceptions on the voice itself and the possibilities of the phonation system, which might make the individual choose unsuitable motor adjustments to a normal voice production10. Due to the fascinating topic and the need for orientating, elucidating and consciousness-raising of the population, especially of those who will become "professionals of the voice", the present study aims to evaluate the occurrence of hoarseness and the working features of college students who start teaching before graduating with no vocal care most of the times. This study aims to analyze the occurrence of hoarseness in College Graduation students (who will become teachers) of Pedagogy, Math and Language courses, and to co-relate the features of possible extra curricular activities regarding the art of teaching. All students involved in this research were interviewed according to The Declaration of Helsinki and Nuremberg Code, by following the Research Rule in Patients (Res. CNS 196/96) - Conselho Nacional de Saúde, after being approved by the Research Ethics Committee and by the college Educational Institution (nº 133/06), where all data were collected from. Students had to sign a Free and Clear Consent Term. In order to perform this study, 100 students were interviewed, through a questionnaire, by collecting their clinical, personal and occupational information. It is a prospective, individual, observational and cross-sectional study defined as an epidemiological inquiry. There was no specific criterion to select students for the research, but there was an approval of the institution where they study at. One hundred students of the Mathematics, Language and Pedagogy Graduation courses took part in this research after having signed the Free and Clear Consent Term, and agreeing with the method applied. Students who were under phonotherapeutic treatment were not selected. A database (DB) was created on the BioEstat 4.0 program. The data regarded: whether the students were already working as teachers or not (regarding occupational time, daily working hours, break time, how many institutions they worked for, environment noise level, water availability); smoking and alcoholic drinking habits; whether they were oriented towards vocal cares by the institution where they were studying; clinical symptoms (throat pain or irritation, hoarseness, voice use difficulties) and the use of drugs or vocal care. The students' identities have not been revealed for ethics reasons. The collected data were stored in the DB. The analysis was performed through BioEstat 4.0 program. Results were analyzed according to descriptive statistics in frequency tables and according to analytical statistics by Qui-squared (X²) non-parametric test - LxC test, by using BioEstat 4.0 by Ayres et al (2006), according to the proposed objectives. It was considered statistically significant p > 0.05. Of the 100 students, 65 (65%) of them have already been working as a teacher at least in one education institution; the others belong exclusively to the academic level. There was an important correlation among symptoms present in the students who were already related to teaching activities (83.08%), according to the findings displayed in Table 1. Table 3 shows that, 83.33% of the students do not search for medical attention when presenting voice-related symptoms. This is a very harmful fact to their health and occupational career development. Such careless behavior can cause a malignant evolution of symptoms, and lead to a withdrawing from work process, either briefly or permanent. Table 4 displays that 26.15% of the students who work as teachers reported having some type of voice care, while 73.85% do not have such a care, which is fundamental for their future career. In Table 5, the graduate students report some types of vocal complaints, such as pain or irritation (27.33%), throat-clearing (21.33%) and hoarseness (21.33%) as the most common. The voice is part of human socialization process, being a component of oral communication and interpersonal relations. It causes impacts on people's quality life, especially on those who use their voices professionally such as singers and other1. Nowadays, teachers are the ones who present more occurrence of vocal alterations2. In the current study, 100 graduate students were interviewed and 65 (65%) of them have already been working as a teacher at least in one education institution (Table 1). Of the total number of student who had already taught, 83.04% presented some type of symptom related to voice misuse (Table 2), agreeing with Fabron and Ornote (1996)12, who reported that teachers present more complaints regarding vocal disorders, and with Figueiredo and Liechavius (1995)13, who found a high number of teachers who present improper vocal behavior, by making voice adaptation to occupational use difficult, causing speech pain, vocal fatigue, hoarseness and voice loss. Besides, among the students who have already been working as teachers, only 26.15% reported some vocal care, while 73.85% reported not having such a habit, which it is essential for their future occupational career (Table 4). When teachers graduate, although they have been well oriented on education process, they are not aware of vocal health, developing vocal disorders when face the lack of technique to use their voice11. 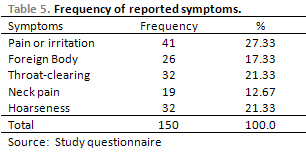 Table 3 shows that, 83.33% of the students do not search for medical attention when presenting voice-related symptoms. This is a very harmful fact to their health and occupational career development. Such careless behavior can cause a malignant evolution of symptoms, what it can lead to a withdrawing from work process, either briefly or permanent. In Brazil, surveys show that 25% of the working population depends on their voices as occupational tool. It is estimated that 2% of Brazilian teachers (around 25,000 professionals) will be withdrawn from their activities by problems in the larynx and in the vocal folds4, 7. In the first consensus on occupational voice, R$100 million/year were said to be spend on public school chain due to theachers' medical leaves14. In Table 5, the graduate students report some types of vocal complaints, such as pain or irritation (27.33%), throat-clearing (21.33%) and hoarseness (21.33%) as the most common, confirming the findings by ALMEIDA (2005) 2. In worldwide researches as well as in Brazil, the main complaints by teacher were: hoarseness, vocal fatigue, pain or irritation and throat clearing. It was found a significant relation between the presence of symptoms that are related to voice misuse and water ingestion. The symptom x water ingestion association occurs in 27% of those who drink little water, contrasting to 8% of those who drink quite a large amount of water. This information agrees with the world literature that states the liquid ingestion, such as water, as a protective manner against voice misuse (Table 6). Of the 100 students, 65 (65%) of them have already been working as a teacher at least in one education institution; Of the total number of student who had already taught, 83.04% presented some type of symptom related to voice misuse. Among students who had already taught in educational institutions, only 26.15% reported having some type of voice care, while 73.85% do not have such a care. One can conclude that 83.33% of the graduate students do not search for medical attention when presenting voice-related symptoms. Among the types of vocal complaints, we could relate: pain or irritation (27.33%), throat-clearing (21.33%) and hoarseness (21.33%) as the most common. Symptoms occur in 27% of those who drink little water, contrasting to 8% of those who drink quite a large amount of water. Based on these results, it is mandatory to perform new surveys, as well as the uprising of academic discipline that would conduct graduate students to a proper use of their voices warning them on the its misuse. 1. Penteado RZ, Pereira IMTB. Avaliação do impacto da voz na qualidade de vida de professores. Rev Soc Bras de Fonoaudiologia. 2003, 8(2):19-28. 2. Almeida SIC. Cisto submucoso de prega vocal: manifestação clínica de laringopatia relacionada ao trabalho. Arq Otorrinolaringol. 2005, 9(3):242-8. 3. Fuess VLR, Lorenz MC. Disfonia em professores do ensino municipal: prevalência e fatores de risco. Rev Bras de Otorrinolaringol. 2003, 69(6):807-12. 5. Oliveira HS, Palheta ACP, Neto FXP, Selles OM, Pancevski D. Análise crítica dos sinais sugestivos de doença do refluxo gastroesofágico à videolaringoscopia em 300 pacientes profissionais da voz. In: Congresso da Sociedade de Otorrinolaringologia do Rio de Janeiro, 2002, 2. 6. Grillo MHMM. The impact of a vocal improvement course in a speech language and hearing science prevention context. Pró-Fono Revista de Atualização Científica. 2004, 16(2):159-68. 7. Nova técnica para a saúde da voz, 2003. Brasil. Disponível na World Wide Web: <www.portalbarra.com.br>. Acessado em 06 de Outubro de 2007. 8. Camarão M. Projeto voltado para o servidor, 2005. Brasil. Disponível em www.belem.pa.gov.br/app/paginas/noticia.php?id_noticia=692. Acessado em 06 de Outubro de 2007. 9. Pinto AMM, Furck MAE. Projeto saúde vocal do professor. In: Ferreira CP. Trabalhando a voz. São Paulo: Summus; 1988: pp. 11-27. 11. Neto, FXP. Aspectos médicos da disfonia ocupacional. In: Semana da Voz - A voz do Trabalhador; 2007. SEAD/SEDUC/CSOST. Belém-PA.
12. Fabron S, Ornote M. Medical problems of professional voice uses, 1996; University V. Tennesse. 13. Figueredo A, Liechavicius C. Perfil do comportamento vocal dos professores da cidade do Rio de Janeiro: um estudo preliminar. In: Congresso Brasileiro de Laringologia e Voz, 3, Encontro Brasileiro de Canto, 1; 1995; Rio de Janeiro (RJ). 14. Reunião Pró-Consenso nacional sobre Voz Profissional, 1; 2001. Sociedade Brasileira de Laringologia e Voz. Rio de Janeiro (RJ). 15. Gerwin, JM, Culton, GL. Quality of Life in Prosthetic Voice Users. Otolaryngology Head and Neck Surgery. 2005, 133:685-8. 16. Elias ME, Sataloff RT, Rosen DC, Heuer RJ, Spiegel JR. Normal Strobovideolaryngoscopy: Variability in Healthy Singers. Journal of Voice. 1997, 11(1):104-7. 17. Ruiz HE, Bainotti A, Ramirez N, Izurzu M, Filas E. Teachers, Actors, Announcers, and Singers Screening for Early Detection of Vocal Alteration. Otolaryngology Head and Neck Surgery. 2003, 131(2):209. 2. Senior student of Medical School at UEPA. 3. Master's degree in Otorhinolaryngology by UFRJ; Doctorate student in Neuroscience by UFPA. Assistant Teacher of Otorhinolaryngology at UEPA (Responsible for the Medical Residence in Otorhinolaryngology of the Hospital Universitário Bettina Ferro de Souza of UFPA). This article was submitted to SGP (Sistema de Gestão de Publicações) of R@IO on June 1st, 2008 and approved on June 30th, 2007 at 10:36:51.